Tiny Burano (pop. 5,300) is the fishing village version of Venice, a clutch of islets threaded by mini-canals and lined by eye-poppingly colored houses that lie in the far northern reaches of the Venetian Lagoon, accessible only by a half-hour vaporetto ride from Murano (itself a 10–15 minute-ride from central Venice). The name of the game on Burano is lace making, an antique art that can still fetch high prices in Venetian shops. Prices can be a bit more reasonable here; you can get a lace-edged hankie for about $10. 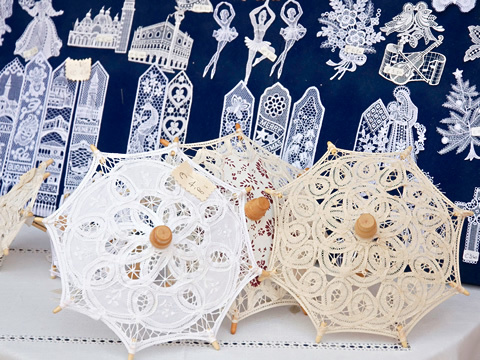 You can learn a bit about the history of lace making at the Museo del Merletto (Piazza Galuppi 187, tel. +39-041-730-034, www.visitmuve.it). Its original purpose, starting in 1872, was to keep the tradition alive, but the school foundered in 1973 for lack of interest. It was brought back to life in 1981 by a local consortium, and for a few decades you could still watch women diligently at work learning this excruciatingly delicate craft on the second floor. Sadly, however, they, too, were forced to end operations in 1995. Now the former school is part of Venice's municipal museums, with displays on lace making and its history. You can get in free with the Museum Pass. 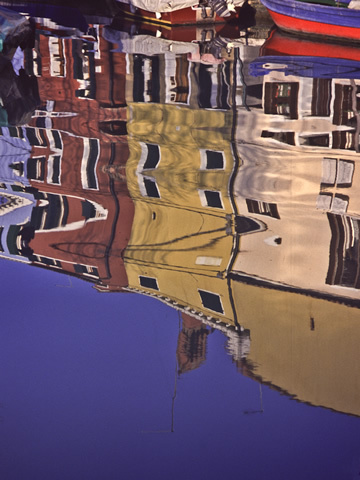 The houses of Burano, reflected here in one of its quiet fishing canals, are each painted in a different super-saturated color with fantastically mismatching colors on the shutters and trim. It's as if the local Crayola factory exploded with felicitous results. The island has as Tiepolo Crucifixion among the canvases in the parish church of San Martino Vescovo at Piazza Galuppi 187. It's open daily 8am–noon and 3–7pm. 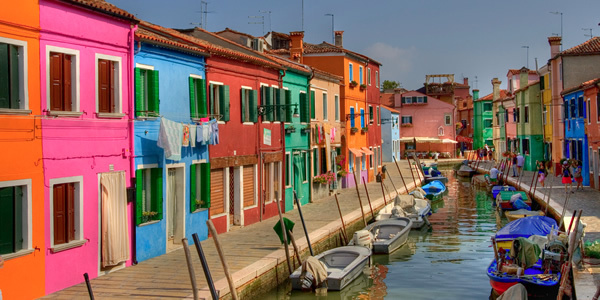 Burano's best attraction, however, is itself: a village in which the houses are all painted in bright primaries and pastels, with shutters and doors in violently but pleasantly contrasting colors. Burano exhibits a leisurely pace of life, one tied to the rhythms of the tides and the coming and going of fishing boats along its diminutive canals. It's a wonderful way to decompress from the hectic, tourist-clogged streets of central Venice, and many a visitor finds himself happily missing his intended boat back to Venice (or on to Torcello) just to spend another hour profitably doing nothing at all on Burano. You can grab a decent trattoria lunch on Burano's main drag at the Trattoria da Romano (Via Baldassare Galuppi 223, tel. +39-041-730-030, www.daromano.it), which has been satisfying day-trippers to Burano for more than 100 years with bow-tied service and white tablecloths surrounded by the columns of a grand dining room (or a sunny front terrace in good weather). How long does Burano take? Planning your day on the islands: You could zip around Burano and be off to Torcello in about an hour—longer, obviously, if you pause for lunch. Shutterbugs will probably end up spending two hours taking pictures of all the colorful houses. How do I get to Burano?